Well, they probably get annoyed. Cephalopods have a nifty trick where they can change color by altering the size and shape of chromataphors, or “colored cell thingy blobs”. Like most cells, these chromataphors react to electricity in different ways. Mainly, expanding and contracting. 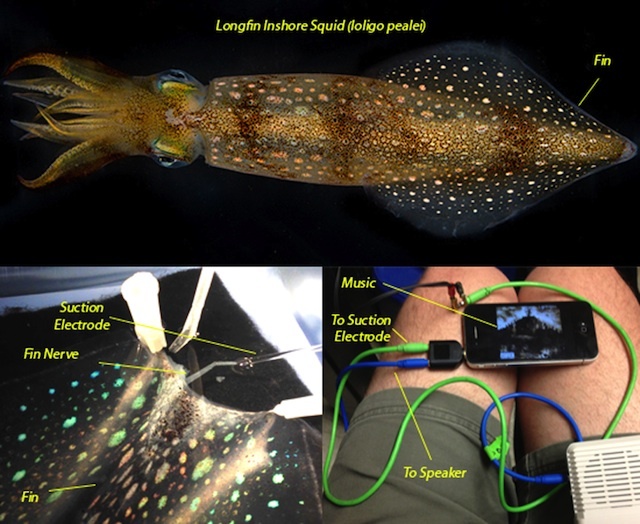 The folks at Backyard Brains, a group that does neuroscience at home, have decided to run an experiment where they pump the signal from Cypris Hill’s song Insane in the membrane right into the nerve on a fin of a squid to see how the chromatophrs react. Not surprisingly, they pulse to the beat. Just because it isn’t a surprise, doesn’t mean its not fun to watch. You know who thinks building a robotic octopus is an awesome idea? EVERYONE. Apparently the idea is a solid enough idea that the European Commision has funded this project. The goal is to mimic the capabilities of the squishiest of the cephalopods in order to advance soft robotics. Or possibly to take over the world. They are hoping to have a fully capable robot octopus with no rigid structures at all. You may be thinking that making a squirming tentacle is easy business. What they are attempting however, is the actual movement of an octopus including extension/contraction as well as grasping. This requires a complex system of control wires as well as “artificial muscular hydrostats” to allow it to do all these movements. A flexible skin covered in sensors will be added to the final design.